Editor’s note: This is a repost of the season wrap up from April 9th. When the site was hacked, this, along with a few other posts, were lost in the recovery process. We took the most recent version any of us had saved and edited it to complete the wrap up. At long last, the post we have dreaded all year, the postseason wrapup, is here. While the season for the Lakers has been done for over a month now, we figured by waiting until college hockey as a whole was done, we could perhaps gain a better view on the season gone by. Simply recaping it right after it was done would have sufficed, but we decided to get nice and lengthy for our readers. That and it was difficult to make time for us to sit down and discuss. The wrapup is set up differently than most of our series previews and recaps from the season. The format involves one of us reporting on a specific team facet in a straightforward manner, while the other responds in a more laid back and casual manner. We have marked who wrote which part of each topic. 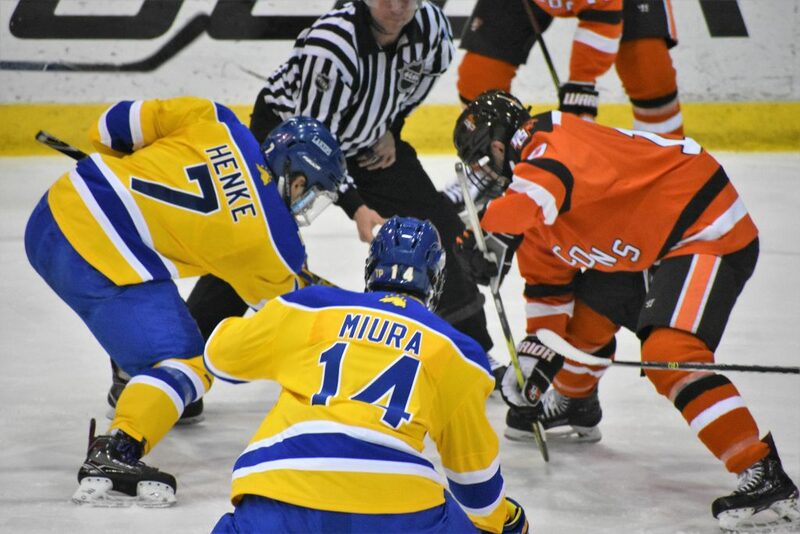 With the 2017-18 season firmly in the rearview mirror, it’s time to look back and judge the season on what it was and how it played out for Lake Superior State. The Lakers took another step backward record-wise, finishing with a 10-22-4 record overall and an 8-17-3-0 mark in Western Collegiate Hockey Association (WCHA) play. By comparison, the Lakers compiled a league record of 8-13-7 and an overall mark of 11-18-7 in 2016-17. While it wasn’t evident at first, some major offseason losses appeared to hamper the Lakers, as the departures of Mitch Hults (11-23—34 in 2016-17), Luke Morgan (7-15—22) and defenseman Kris Bindulis (1-11—12), among others. Combined with the graduation of Gus Correale (6-6—12), the Lakers lost nearly one third of their scoring from 2016-17. While the Lakers did get improved production out of some forwards, such as Jake Hand (7-5—12 in 2017-18 vs 0-3—3 in 2016-17) and Brayden Gelsinger (8-10—18 vs 5-10—15), other forwards seemed snakebit throughout the year, as Gage Torrel (14-8—22) failed to put up the points seen from him in the past (to be fair, Torrel was still 6th on the team in scoring, as he quietly picked up 5 goals and 11 assists). As for the other big point-producers, many of them replicated their success from previous seasons. While Diego Cuglietta, Max Humitz, Anthony Nellis and J.T. Henke may not have put together breakout-type seasons, they brought the consistency from previous years to the table. Lake Superior’s newcomers up front unfortunately did not make much noise on the scoresheet. Hampus Erikkson hit double digit points, but the other three freshmen forwards tallied just five points between them. Granted, Chase Gamelin (0-3—3), Alex Ambrosio (0-1—1) and Yuki Miura (0-1—1) did not play full seasons (Ambrosio did not join the team until midseason and Miura was ineligible and injured throughout most of the campaign). Although they did not tally any goals, their presence was certainly noticed, as each of them gave the team a shot in the arm when inserted into the lineup. I 90% have to agree with Mike’s assessment here. I feel like a lot of us knew that the departures of Hults, Morgan and Bindulis was going to affect the team, but certainly nobody could’ve guessed at just how much. Hults in particular, to myself at least, seemed to score quietly. Maybe it’s just rose-colored glasses, but it seemed like he tallied a ton of points, but it didn’t seem like a big deal. I’ll touch on Bindulis in the Defense section. Likewise when it comes to Gage Torrell: it wasn’t so much that he had scored quietly, it just took like half the season for him to record any points. If hitting posts or the crossbar counted, Torell could’ve taken the team scoring title. The additions of Ambrosio and Miura were huge. Ambrosio solidified the middle of the ice and seemed to have a presence on the ice in a way that the Lakers really didn’t have prior to the new year. Having Miura for a full year will certainly make things interesting come the 2018-2019 campaign. The 2016-17 Lakers D-corps wasn’t exactly wowing the league. 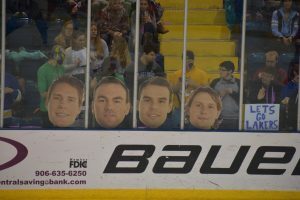 With two blueliners departing the team (James Roll via graduation and Bindulis via signing a pro contract), there were bound to be some new faces complementing the returning players, which included three seniors. Lake Superior had 10 defensemen on the squad. Among them were five newcomers, including Steven Ruggiero, a sophomore transfer from Providence. The native of King’s Park, New York was not eligible for the first half of the year, but was a consistent presence on the ice in the second half of the year. 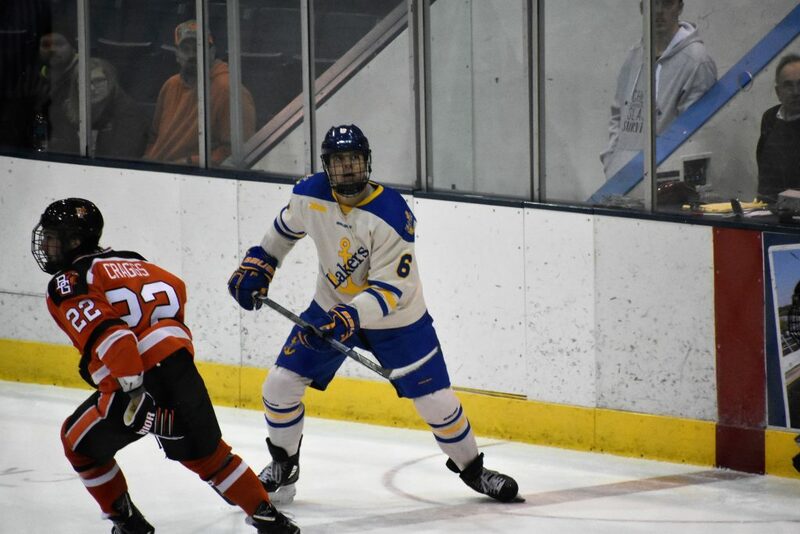 As for the returning blueliners, Collin Saccoman looked to build on a successful freshman year where he was among the nation’s leaders in blocked shots. Unfortunately, like Käelble, Saccoman was injured in the series at Denver early in the year. As a result, the Lakers were without three of their more mobile defenders for nearly half the season. Roll also transferred with his final year of eligibility to Niagra, which is closer to home. Don’t forget that Ruggerio is also a sixth round pick for the Anaheim Ducks. These two injuries really showed at how shallow the Laker’s blueline was this season. Many nights you had a top pairing of freshmen Tyler Anderson and William Riedell, which to my eyes, did not pass the eye test. Once Ruggerio was slotted into the lineup, it did get better, with Kyle Chatham really picking up his play to close out his final year at Lake State. It also did not help matters that captain Aiden Wright was often used as a fourth-line winger. Goaltending this year was inconsistent. There’s no two ways about it. There was no clear cut winner between veteran Nick Kossoff or young upstart & NAHL star Mareks Mitens. I’m not sure if the same goalie finished both games in a weekend, to be honest. One night, one of the two may stand on his head, yet the next be pulled after a period. This, along with the defense, should be two areas that Whitten & co really need to be focusing on this offseason. Inconsistent probably says it best. The state of the defense in front of the net certainly did not help matters. As an example, the second game at the Three Rivers Classic saw Arizona State pepper Kossoff with nearly 50 shots. While the shots may have not been the best quality, it still says something when that many shots find their way to the goalie. One bright spot for the netminders was how the four game winning streak stacked up for them. 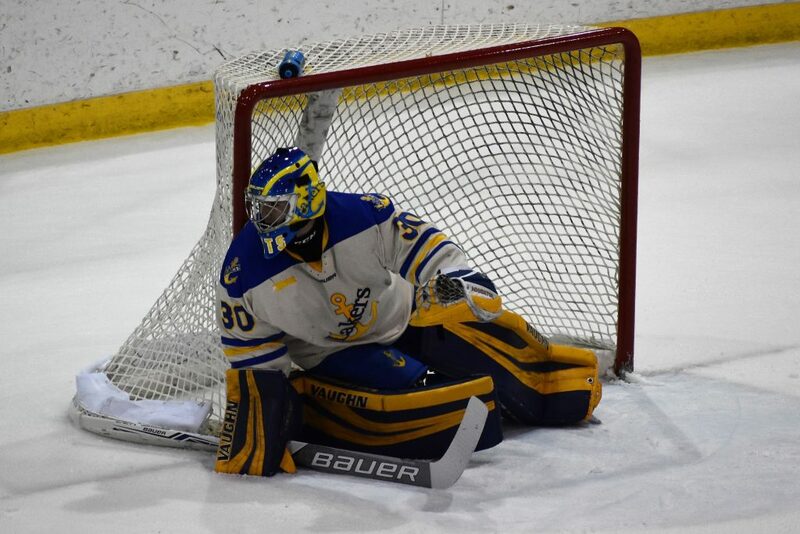 After Kossoff earned a shutout on Friday against Bemidji State, Whitten made the unconventional move of going with Mitens the next night, who promptly had a shutout of his own. The coach explained his reasoning by saying, with sitting Kossoff after his big shutout, it gave him a full week to dwell on it. He further mentioned that, often times, good vibes from a Friday night win are forgotten if Saturday does not go well. Whatever the reasoning, Whitten made the same move the next week at Alaska Anchorage and it paid off with two more wins. Two other goaltenders were on the Lake Superior roster during the season, neither of whom played any minutes this season. Sophomore Cooper Lukenda departed the team in November for juniors (more on that later), while freshman Roman Bengert was ruled ineligible for the season. From the sounds of things, Bengert will be eligible to play next season. Despite all that has been said, our penalty kill wasn’t terrible this season, just about the middle of the pack when looking at all 60 division 1 teams (80.6%). Power Play did lag a bit further behind, however, with only 17.7%. Among WCHA teams, the Lakers were 8th in power play percentage and 7th in penalty kill percentage. The old addage of having the sum of the percentages be 100 would show what many already knew — the Lakers had their struggles. Adding them together gets 95.83, short of the ideal 100, but better than Alaska and Michigan Tech, both of whom finished higher in the standings. Part of the struggles on the power play could stem from a lack of scoring defense. Nearly every successful power play unit out there has one or two blueliners who do a tremendous job of getting the puck to the net. The highest scoring defenseman of the roster this year was Käelble with one goal and six assists. As for the penalty kill, Whitten is often heard saying the goaltender has to be the best penalty killer. Thinking back, I can’t say as though I recall either netminder allowing in any soft goals while shorthanded. 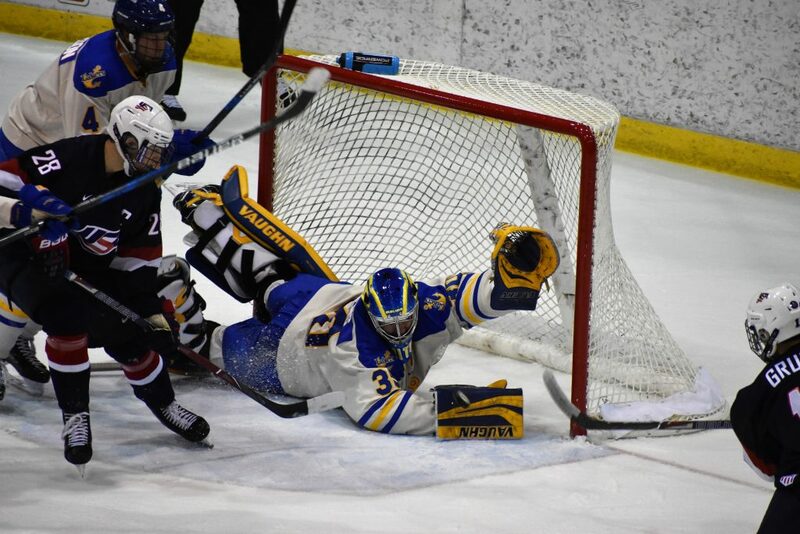 25 goals were allowed by LSSU while killing penalties. One interesting statistic concerning special teams is the Lakers had, in league games, the second fewest power play opportunities (113) and the second fewest penalty kill situations (121). The first departure seen this year was of goaltender Lukenda. A sophomore, Lukenda ended his Laker career without ever having played in a game. The Sault Ste. Marie, Ontario native did not play junior hockey before coming to Lake Superior, and was perhaps not prepared for the level of competition. As of March 20th, he played 20 games with the Kemptville 73’s, accumulating a 4.54 goals against average and an .881 save percentage. I can’t say it was shocking to see Lukenda go. He may have gotten some actual playing time had he stayed, what with the inconsistent goaltendings, but taking a look at his GAA and SV%, I’m not sure how well he would’ve been able to play had he stayed. Junior forward Hayes played in just five games this season before departing — right before injuries began taking their toll on the forward unit. Hayes signed a pro deal with the Mississippi RiverKings of the Southern Professional Hockey League. After going 2-3—5 in 21 games, the forward found himself playing with the Federal Hockey League’s Watertown Wolves, where he has gone 7-9—16 in just 10 games. I ran into C.J. right before the start of the season, shortly after the guys came back to town for school. He certainly seemed to have the right attitude, and it’s a shame he didn’t see more ice time before departing the team. But like Lukenda before him, he wasn’t getting any real playing time, so I can hardly blame him. That being said, with all the injuries to the forward unit, C.J. could’ve seen some real minutes had he stuck around. Brought in over the Christmas break, Ambrosio had played parts of four seasons with the Coquitlam Express of the British Columbia Hockey League. With the injuries sustained by the forward unit, Ambrosio stepped right into the Laker lineup against Bemidji State. Although he only tallied one assist in 14 games, the native of Burnaby, B.C. was very noticeable on the ice, and, apart from scoring, showed little difficulty adjusting to the college game. I can’t say enough about this kid. Mid-season acquisitions seem to be rare in the college world, and making the switch and traveling almost an entire continent, Ambrosio really shone through the darkness that was the start of the second half of the year. He helped solidify the middle of the ice, and though he is only listed at 5’10”, he was not afraid to drive the net, or get into those dirty areas. Having a full offseason dedicated to college hockey will make this kid a force come next season. 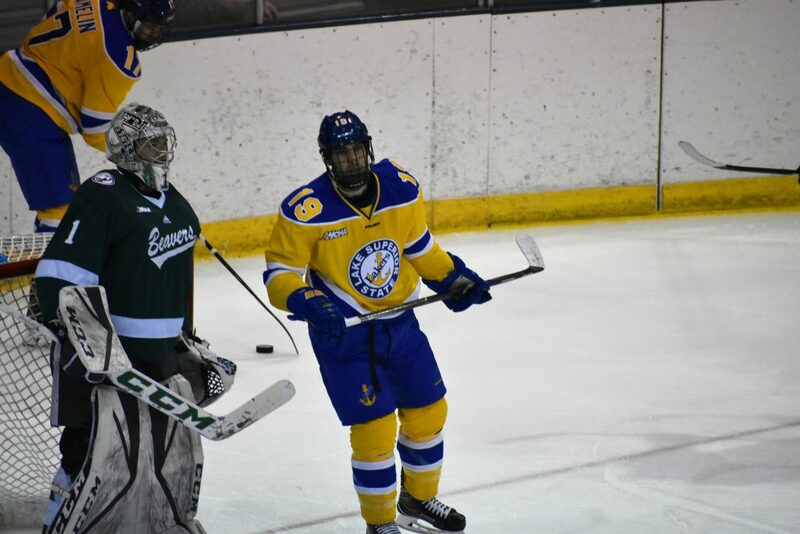 Junior forward Nenadal found himself separated from the team following an off-ice incident in December. While little was said by the coaching staff, it was generally understood that Nenadal was still a member of the team. That appeared to change after another off-ice incident in late January, when he was identified as the male suspect that knocked over an ice sculpture in front of Cup of the Day. After that incident, his name was removed from the team roster. Although there has been no word from the team since, the removal of his name can best be interpreted as his dismissal from the team. In the weeks leading up to his initial dismissal from the team in December, the team was really starting to sink after having a decent start to the season. After being told he was still with the team, just suspended (essentially), play did not initially improve. It wasn’t until the Cup of the Day incident, and his removal from the roster, that play seemed to improve. Hopefully without Nenedal returning next season (presumably, at least), the future is looking brighter for the Lakers, as it seems like whatever dark cloud was hovering over the locker room is now gone. I personally have a lot of questions surrounding how the Nenedal incident was handled, but as it’s been proven time and time again, it’s hard to get any real information out of the locker room, so we may never know key details to it all. While the forward unit seemed to be snake bitten for most of the season, I feel like a large part of the issues came down to the back end of play. Inconsistent play from the blue line helped lead to inconsistencies in net. Combine all this with a questionable locker room atmosphere (there was a players-only meeting in December), and you’re going to have a bad time. The front unit did seem snakebitten at times, but to be fair, the Lakers had the 2nd best offense out of the four years that Whitten has been at the helm. It does feel as though many of the issues were tied into the defense. With three blueliners graduating this year (all of whom logged significant time in their careers), it will be up to the next classes to come in and fill those skates. There was much potential on display, particularly from the players who played little due to injuries and eligibility. It has me wondering what a full season from them will look like. All in all, there is promise for the future. BIG RAPIDS, Mich. — The Lake Superior State playoff hopes came down to the final game of the regular season. Needing a win against Ferris State to stay alive, the Lakers could not find the equalizer late, as the Bulldogs netted two empty netters en route to a 4-2 win. With the loss, the Lakers failed to qualify for the WCHA postseason for the second time since joining the league, and the first time under head coach Damon Whitten. Lake Superior got the important first goal of the game when defenseman Collin Saccoman collected a pass from Bryan Basilico and beat Darren Smith. Although the Bulldogs outshot the Lakers 14-12 through the first 20 minutes, netminder Mareks Mitens kept Ferris State off the board. Early in the second period, Coale Norris found the back of the net for Ferris State, tying the game in the process. Norris, who had the empty-netter the previous night, earned his 9th goal of the year. At 7:37 of the third period, Norris put Ferris State ahead for good. Despite numerous chances for the Lakers (including a post for Anthony Nellis,) Lake Superior could not find the crucial goal to force overtime. With Mitens pulled for an extra skater, the Bulldogs’ Mitch Maloney put the game out of reach by hitting the empty net. Their season in jeopardy, the Lakers pulled Mitens again, trying to surmount a two goal deficit. Again, Maloney put the puck in the back of the empty net, making the score 4-1 Ferris State. A fair amount of action took place shortly after the ensuing faceoff. Lakers defenseman Tyler Anderson took a Ferris State player hard into the boards, which led to everybody on the ice pairing off. 43 penalty minutes were assessed on the play, including 15 to Anderson (5 for contact to the head, plus a 10 minute disqualification). As the game was winding down, Gage Torrel managed to get around the Bulldog defense and beat Smith. Torrel’s fifth goal of the season came with just 26 seconds remaining in play — not enough time for a Laker rally. Mitens finished the night with 34 saves on 36 shots faced. In picking up the win, Smith 30 of 32. With the loss, the collegiate careers of Aiden Wright, Kyle Chatham, Ryan Renz and J.T. Henke came to an end. Henke, the lone forward of the group, finished his Laker career with 79 points in three seasons. Had he played his freshman season with the Lakers (as opposed to the University of Maine), he could have potentially become the first Laker to earn 100 career points since Dominic Monardo in 2013. 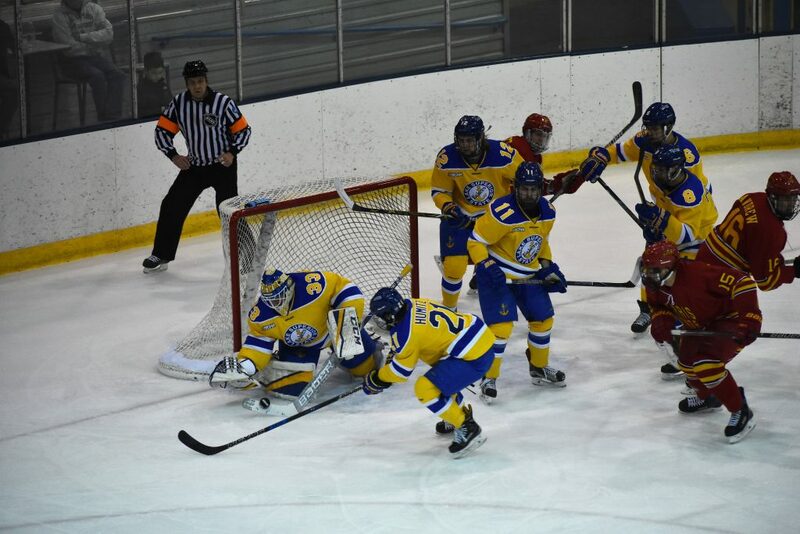 BIG RAPIDS, Mich. — Needing at least one win for any hope of qualifying for the Western Collegiate Hockey Association (WCHA) postseason, the Lake Superior State hockey team could not connect, as the Bulldogs of Ferris State took a 4-1 win at Ewigleben Ice Arena. Ferris State (13-21-1, 10-16-1 WCHA) snapped the Lakers’ four game winning streak — all of which came on the road. Lake Superior (10-21-4, 8-16-3 WCHA) hoped to go into Ewigleben and get a quick goal to silence the crowd. A quick goal was scored, but by the home team, as Captain Corey Mackin put the Bulldogs up 1-0 just 45 seconds into the game. Despite surrendering the early lead, the Lakers remained determined, giving Ferris State netminder Darren Smith plenty to do, as the shots favoured Lake State 13-10 after twenty minutes. The Bulldogs got another early goal in the second period, as Mackin again capitalized. The captain collected a pass from Mitch Maloney behind the net and beat Lakers goaltender Nick Kossoff on the right side. Ferris State added another goal later in the period from Zach Szajner, sending the Lakers back to the dressing room trailing 3-0 after two periods. Lake Superior, after peppering Smith with shots all night, finally managed to get one by him, as Hampus Erikkson got a piece of an Anthony Nellis shot, cutting the Bulldogs’ lead to two goals. Despite pulling Kossoff for an extra skater at various points throughout the period, the Lakers could not solve Smith again. An empty netter with 5 seconds remaining from Coale Norris sealed the Lakers’ fate. In goal, Kossoff made 27 saves on 30 shots. Across the ice, Smith was credited with 37 saves on 38 shots. Coupled with an Alabama Huntsville win over Bowling Green, the Lakers’ postseason hopes appeared to be all but over. However, the series between Alaska and Alaska-Anchorage also has bearings on the WCHA playoff picture. With the Seawolves playing spoiler by earning a 5-3 win, the Lakers are not yet eliminated from the postseason picture. Their fate will come down to what they can do in their game against the Bulldogs tonight. ANCHORAGE, Alaska – Anthony Nellis claimed his second consecutive game winning goal and Mareks Mitens slammed the door shut as the Lake Superior State Lakers (10-20-4, 8-15-3 WCHA) earned their fourth straight win in a 2-1 win over Alaska-Anchorage (2-24-4, 2-19-3-3 WCHA). Entering the final month of the season needing to essentially win out in order to qualify for the WCHA Tournament, the Lakers have risen to the task. Perhaps even more impressive is that they have had to do this completely on the road. Neither team found the back of the net in the first period. Both teams made a change in net from the previous night, as Mitens got the start in place of Nick Kossoff, while Olivier Mantha was replaced in the Alaska-Anchorage net by Brody Claeys. The Seawolves opened the scoring when Trey deGraaf capitalized on a power play opportunity. The third goal of the year for deGraaf resulted in the first lead of the weekend for Alaska-Anchorage. Just moments after Jake Hand was denied by Claeys on a great 5 on 3 chance, Max Humitz tied the game with just 1.7 seconds remaining in the period. A lengthy review of a potential offsides call did not overturn the goal, resulting in a 1-1 tie after 40 minutes. Shortly before the midway point of the third period, Anthony Nellis cashed in for his second goal of the weekend. A turnover led to an odd man rush, which Nellis capitalized on, earning his 12th goal of the year and his third in four games. With just over five minutes left in regulation, Bryan Basilico appeared to put Lake Superior up 3-1. What would have been his second goal of the season, however, was waived off after a review due to goaltender interference. Down late, the Seawolves cranked up the pressure on Mitens, peppering the Latvian netminder with everything they could. The freshman remained steady in net, despite point blank shots and odd deflections, as the Lakers held on for a 2-1 win. Both teams had 23 shots on net. In picking up his third win of the season, Mitens stopped 22 of 23 (including 10 in the third period), while Claeys made 21 saves. In addition to being equal on the shot counter, both teams were also equal on the power play, as the Seawolves and the Lakers each went 1 for 4 with the odd man. The Lakers are idle next weekend and will be keeping a close eye on Ferris State. The Bulldogs have a one point lead on Lake Superior and will play Minnesota State this weekend. The two teams will face each other in the following week in Big Rapids before the start of the WCHA Tournament.